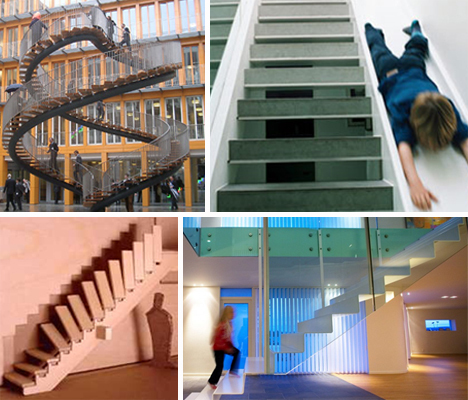 Stairs aren’t just a boring, utilitarian part of our homes and public buildings. 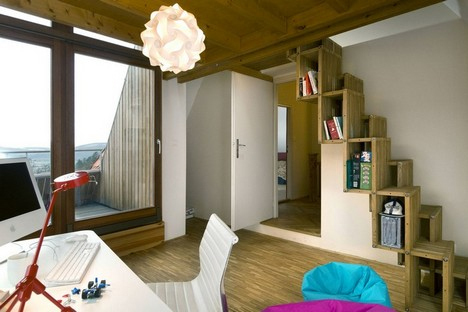 They’re an opportunity for an architect to really make a statement and do something bold and distinctive. 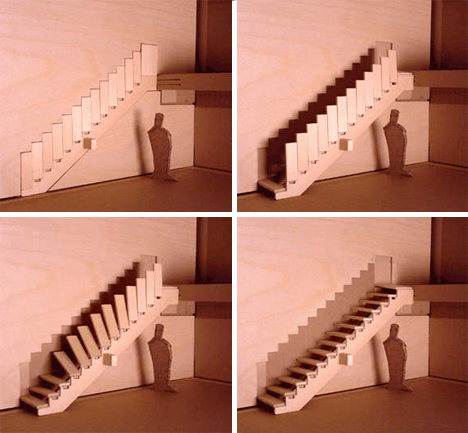 From staircases that float to stairs that fit in impossibly tiny spaces to staircases that go nowhere, this often-overlooked part of everyday architecture is being rethought by many designers and architects. You’ll see no beige-carpeted run-of-the-mill staircases here; these are some (more!) of the best, strangest, and most beautiful staircases in the world. 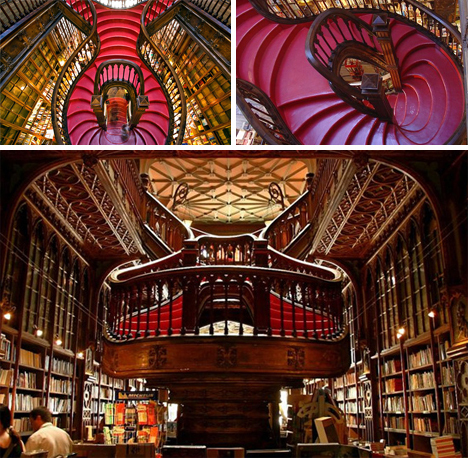 These majestic and impressive stairs can be found in Lello Bookshop in Portugal. The sheer heft of this staircase is balanced nicely by the smooth flow of all of its shapes. The grand staircase begins as two sets of steps on the upper level, then the two become one when the entire staircase folds under itself to glide smoothly to the lower floor. 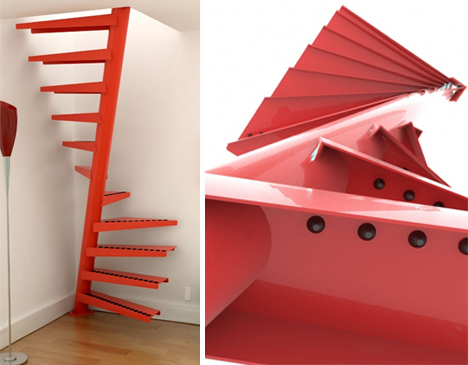 The color and sturdy dimensions give the entire staircase an almost mouth-like appearance. This incredible design, believe it or not, is made from 10mm thick sheet metal, and there are no hidden suspensions keeping it aloft; just wall brackets and tension. The ribbon of sheet metal zigzags up the space to make the exposed staircase appear open, airy and mysterious. And best of all, the whole staircase is surprisingly sturdy. 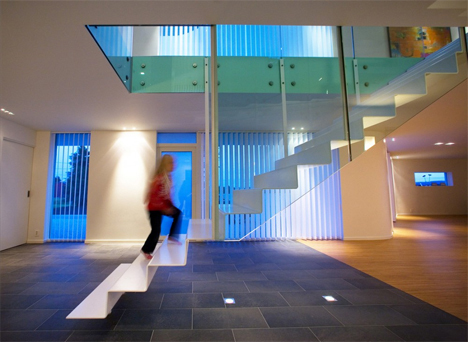 Designed by HSH Architects, the staircase is in the main living area of a home in Prague. 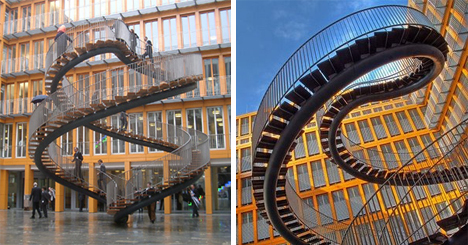 This crazy staircase to nowhere was commissioned by accounting firm KPMG in Munich in 2004. It was built by artist Olafur Eliasson and now stands in the courtyard of the KPMG building. Besides being an interesting focal point, it’s a functional staircase – if you consider traveling its pointless path “functional.” Although the stairs won’t actually get you anywhere, it’s probably a fun lunchtime break for the people who work in the building. For hopelessly tiny spaces where traditional stairs would take up too much precious floor real estate, EeDesign has a solution. These stairs fit into just over 1 meter of floor space to provide a passage to higher ground that’s basically like walking up a spiral ladder. They come in many colors and can be customized to fit each unique home and space. The Gray Hotel in Milan is a stunning modern building designed by Florence architect Guido Ciompi. There are countless things to love about the building and its furnishings, but these floating stairs stand out. Obviously, one would need to be very careful when ascending them after a night of drinking, but their clean lines and unique design are unforgettable. London architect Alex Michaelis may have discovered the quickest way to get the kids to come down for dinner: let them slide down. Alex let his kids have some input as to what features they wanted in the house he was building, and the staircase slide was one of them. It may not be the most practical design ever, but when the kids are happy, everyone’s happy. For everyone who has ever gotten around in a wheelchair or pushed around a baby stroller, you know how frustrating it is to encounter a building with stairs and no ramp. Almost as bad are the steep, poorly-designed ramps that were simply tacked on later. 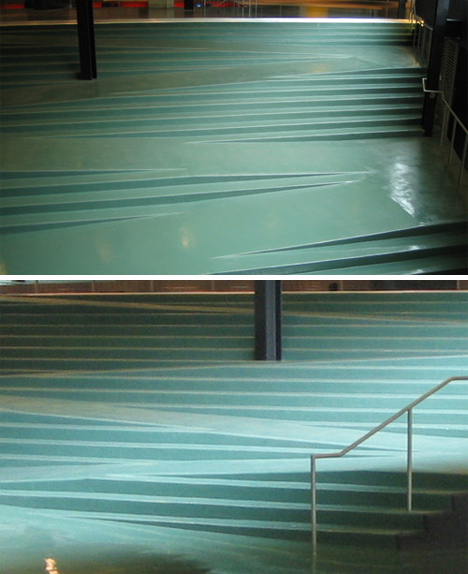 The McCormick Tribune Campus Center in Chicago made a stylish compromise between stairs and ramp with this staircase that incorporates a zig-zagging ramp with the stairs. Of course, it looks like it might take more energy making all of those twists and turns than it would to just go up an ordinary ramp, but aesthetically it’s very sharp. Unlike other floating stairs, this staircase by Bernstein Architecture doesn’t rely on wall brackets to support the steps. Instead, it uses a network of cables to hold each one aloft and completely motionless. 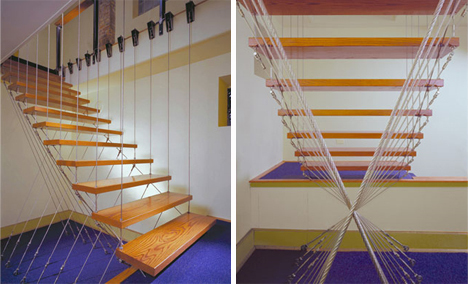 According to the architect, the stairs don’t move even a little when they’re stepped on, even though they’re subject to very heavy traffic in their home inside the There TV office in Chicago. 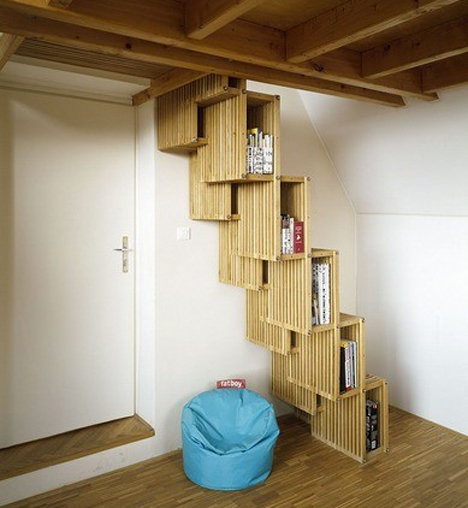 While such a precarious-looking alternating tread stair design would probably never pass building code in America, this ingenious bookshelf staircase makes very good use of a small space. It comes from Czech architects Adam Jirkal, Jerry Koza and Tomáš Kalhous and resides in a house they remodeled in Všenory, Czech Republic. When are stairs more like a door? When they glide smoothly into the wall, disappearing to prevent unwanted guests from wandering up to your home’s upper level. 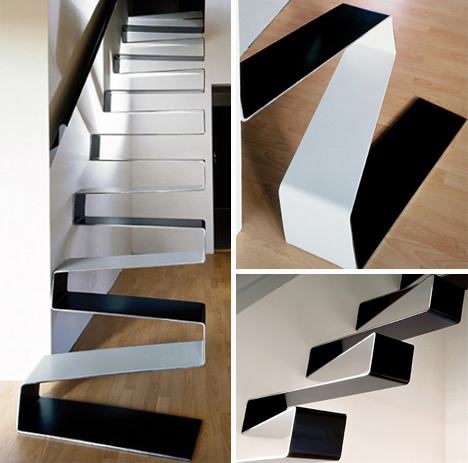 Though it’s just a concept, this disappearing staircase from designer Aaron Tang would be the perfect addition to any international spy’s house. It operates on interior pistons that drive the whole assembly out from the wall, then help each stair lower gently in a wave-like motion. The touch of a button opens or closes the stairs from either end of the staircase. These stairs reside in Villa Glittenberg, a family home on the west coast of Norway built by Saunders Architecture. 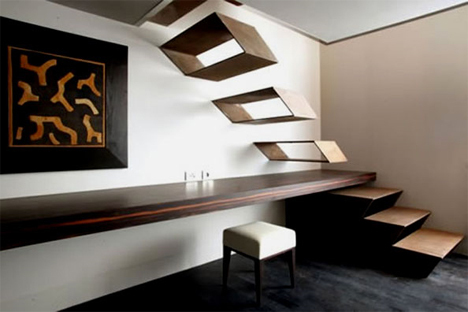 The staircase is made of 1 cm-thick steel and weighs close to one metric ton. It is so massive that it had to be lifted into the home through a skylight with a special crane. The results are simply stunning, though, as the white stairs hovers above the ground and the residents seem to float up to the upper level. Martino Gamper produces consistently elegant and distinctive custom furniture, and this under-staircase storage drawer system is a testament to his ability. In this beautiful English country home, Gamper installed an ingenious hidden storage staircase to give the occupants more room for storage and to use up some previously forgotten wasted space. 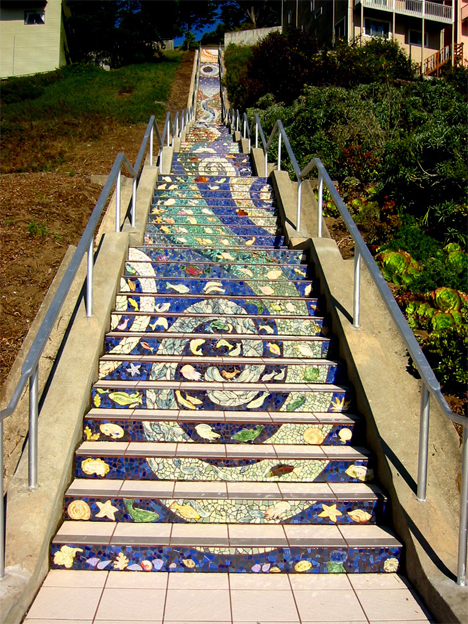 In the summer of 2005, the residents of the Golden Gates Heights neighborhood banded together to make a unique and long-lasting public art project: the 16th Avenue Tiled Steps. The risers of all 163 stairs (on city property) were decorated with mosaics that neighborhood volunteers assembled. The resulting mural is absolutely breathtaking, covering images from deep in the sea to high in the sky. These wooden library stairs are rich, full of character, and absolutely beautiful. The slats are made from spalted white birch and they were all cut from the same log. The cherry tree in the center is real, and it goes through the ceiling to emerge on the upper floor as the staircase’s newel post. The steel supports and mahogany handrails just add to the luxurious feeling of this amazing staircase. Although it was only a temporary installation, these piano stairs deserve a mention based solely on the number of smiles they induced. The Fun Theory is a campaign from Volkswagen that’s focused on bringing a smile to everyday life. When they installed this piano keyboard in a Swedish train station, many more people than usual decided to take the stairs. The unexpected larger-than-life toy brought out the inner child of a lot of people during its short life.